The Central Board of Secondary Education has launched its digital platform ‘Parinam Manjusha’ to provide students an easier access to their academic documents online. The Indian Railways and IRCTC have decided to include “transgender” as third gender in ticket reservation and cancellation forms in the offline as well as the online mode. The decision is in compliance with a 2014 Supreme Court direction, calling for the inclusion of hijras, eunuchs, apart from binary gender, as third gender. This is to safeguard their rights under Part III of the constitution. The Supreme Court framed a rule that the former judges of the apex court can hire domestic help at public expense. According to the ruling, the domestic help can also be absorbed as a permanent employee of the court if he or she serves the retired judge or spouse of the same for 10 years. The Chief Justice of India has been granted power under article 145(2) of the constitution to notify issues relating to service conditions of the court’s “officers and servants”. The Indian-origin Portugal Prime Minister, Antonio Costa will be the Chief Guest at the 14th Pravasi Bhartiya Divas Convention to be held from January 7 to 9, 2017 in Bengaluru, Karnataka. Actor Amitabh Bachchan starrer movie ‘Pink’ has been invited for a special screening at the headquarters of the United Nations in New York. This was done by the UN Assistant Secretary General, Movses Abelian. Lieutenant General Qamar Javed Bajwa has been appointed as the new Army chief of Pakistan. He will be succeeding Raheel Sharif. Previously Mr. Bajwa had served alongside former Indian Army Chief Bikram Singh on a UN mission in Africa’s Congo. Malaysian political cartoonist Zulkiflee Ul-haque, also known as zunar, was arrested under the sedition act for cartoons that allegedly insulted Prime Minister Najib Razak. The world’s first Bollywood theme park has opened in Dubai, United Arab Emirates (UAE). The theme park will have 16 cinematic rides, six themed restaurants and a choice of 30 live shows that are inspired by contemporary and classic blockbusters, including the Dabangg action movies and epic historical drama Mughal-E-Azam. The vibrant cultural rich park boasts cinemas, a theatre, rides, simulators and 4D shows of popular Hindi movies. Ruskin Bond has returned after a long sabbatical with a new collection of short stories titled ‘Death under the Deodars: The Adventures of Miss Ripley Bean’. It is a murder mystery, published by Penguin India, and is a result of numerous thoughts and conversation shared between Bond and Udayan Mitra from Penguin India. India’s Rio Olympics silver medal-winning shuttler PV Sindhu finished as runner-up at the Hong Kong Open Super Series after losing to world number 3 Taiwan’ Tai Tzu Ting. This is world number 9 Sindhu’s second consecutive Super Series final, after winning the China Open last week. With this, her nine-match winning streak came to an end. On the other hand, in the men’s category, Indian shuttler and current world number 43, Sameer Verma finished as the runner-up too after losing to host country’s Angus Ng Ka Long. This was Verma’s maiden appearance in a final of a super series event. Sachin Singh became only the 3rd Indian boxer to win a gold medal at the Youth World Championships after registering a unanimous win over Cuba’s Jorge Grinan in St. Petersburg, Russia on Saturday. Indian golfer Aditi Ashok claimed her second successive victory on the Ladies European Tour after winning the inaugural Qatar Ladies Open. Mercedes’ Formula One driver Nico Rosberg won his maiden Formula One Drivers’ Championship to become 33rd Formula One World Champion in F1 history. Rosberg finished second to Lewis Hamilton in the Abu Dhabi Grand Prix where he only required a podium finish in order to deny the latter his fourth straight world title. 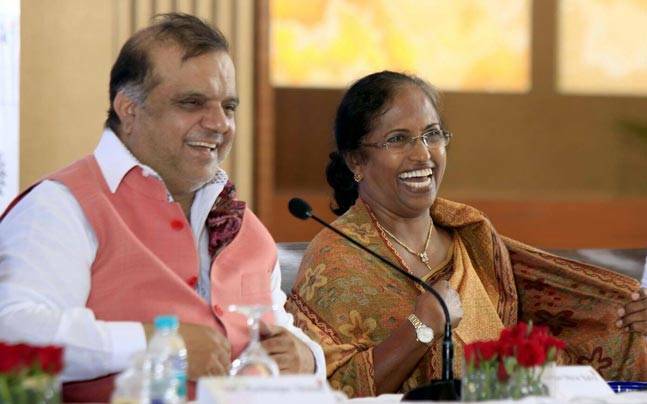 Former Hockey player Mariamma Koshy took charge as the President of Hockey India after the 41st Hockey India Executive Board meet. Koshy will be succeeding Narinder Dhruv Batra who in recent past was elected as the first ever non European (and first Indian too) chief of FIH. In addition, Sec General of Hockey India, Mohd Mushtaque Ahmad took over as the chairman of the Hockey India League Governing Board. 1. Who has been selected as the president of Hockey India? 2. Who won the 2016 F1 drivers’ championship? 3. Who is the author of the book ‘Death under the Deodars: The Adventures of Miss Ripley Bean’? 4. Where the world’s first Bollywood theme park has opened? 5. What is the name of the digital platform launched by C.B.S.E. to provide students an easier access to their academic documents online? 6. Who will be the chief guest at the 14th Pravasi Bhartiya Divas Convention? 7. Who is the new Army chief of Pakistan?